The recent announcement of an enhanced reward for tips leading to the arrest of opioid dealers is not only be applauded by law enforcement and prosecutors, but also those in health care who've seen the dangerous effects of opioid abuse. Opioids certainly have a place in medicine, said Dr. Chris Acker at CHI Health Lakeside. As a physician working in the emergency room, he sees what happens when these drugs are misused, blurring the fine line between use and abuse. "[It's either] accidentally taking too much or using them improperly and that's what is really causing the most significant problem," he said. Acker believes the fight against the opioid epidemic needs to be done on several fronts. Across town at Omaha Police Department headquarters, Omaha Crime Stoppers knows this well. "Money talks and there is no loyalty in the drug world. Whatsoever," said Mark Langan, board president for Omaha Crime Stoppers. A coalition of law enforcement, health care providers and prosecutors stood behind this initiative launch Wednesday morning. 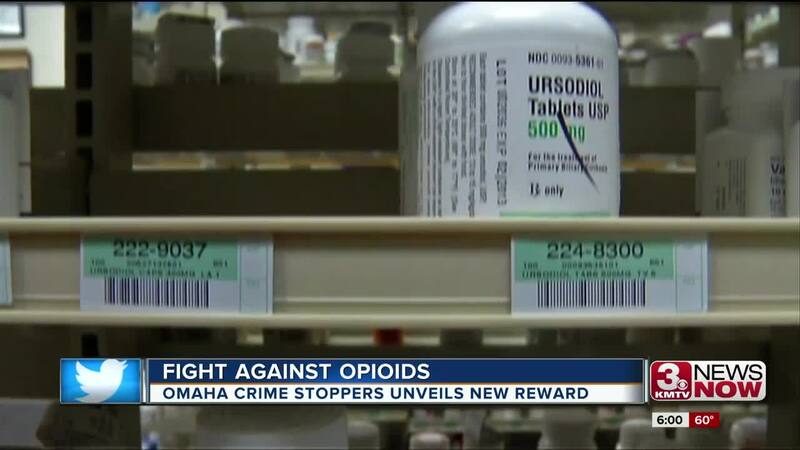 The enhanced reward of $5,000 goes towards tips leading to the arrest of opioid dealers, the money made possible by Blue Cross Blue Shield of Nebraska and Kohll’s Pharmacy. It comes as officers use naloxone for overdose calls, while also risking exposure to drugs like fentanyl and carfentanil . Earlier this month, a Lincoln officer became exposed to suspected fentanyl-laced heroin while searching a suspect. A Lancaster County deputy administered Narcan and the officer returned to work after being checked at a hospital. According to Police Chief Todd Schmaderer, the fight against opioid use in the metro involves working with the medical community while also focusing on enforcement and crime prevention.